한말 홍성군 지역에서 있었던 의병활동 가운데 홍주성 전투에서 희생된 수백 의병들의 유해를 모신 묘소이다. 1905년 일본과의 을사조약이 체결되자 각지에서 의병활동이 일어났는데, 충청남도 홍성지방에서는 이조참판 민종식을 중심으로 활발한 활동이 전개되었다. 1906년 고종 황제의 명을 받아 의병을 모아 남포와 보령에 있는 일본군을 습격하여 병기를 탈취하였으며, 3월 20일에는 홍주성을 함락시켰다. 그러나 일본군의 대포 공격이 본격화되면서 의병 수백명이 전사하여 시체가 홍주천변과 남산 일대에 흩어져 방치되었다가 1949년에 항일의병의 유골임이 밝혀져 이곳에 모셔졌다. 홍주의병의 핵심적 연구자료인 . , 등의 자료를 종합해 볼 때, 홍주성 전투에서 희생된 의병 전사자는 최소한 98인, 많게는 수백이라는 기록이 확인되었다. 묘는 봉분 아랫부분에 둘레석을 둘렀고, 묘의 오른쪽에는 정인보가 짓고 심상직이 쓴 묘비가 있으며, 좌우에는 망주석 1쌍이 세워져 있다. 사당인 창의사(彰義祠)에 900의사의 위패를 봉안하고 있어 구백의총이라 했던 것을 1992년 홍주의사총으로 이름을 바꾸었다. 매년 5월 30일 순국의사 추모제를 올리고 있으며, 을미의병으로부터 연면히 계승되어 온 한말 홍주의병의 호국정신을 기리는 중요한 유적이다. 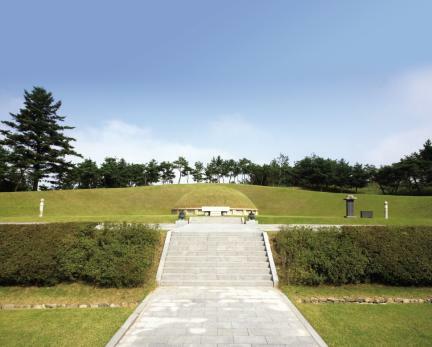 This is a tomb enshrining the remains of hundreds of soldiers of “righteous armies” who died in the battle of Hongjuseong Fortress in Hongseong-gun toward the end of the Korean Empire Period. When the 1905 Protectorate Treaty with Japan was signed, the righteous armies all over the country did not take it sitting down but were particularly active in the Hongseong region in Chungcheongnam-do under the leadership of Min Jong-sik, a high-ranking government official at the time. 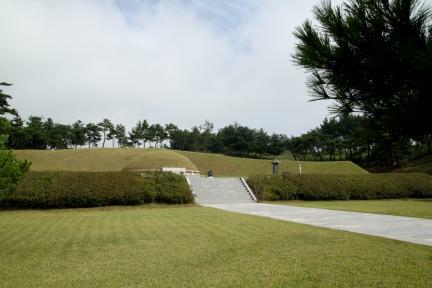 In 1906, under the orders of Emperor Gojong, Min raised an army and attacked the Japanese soldiers in Nampo and Boryeong, seizing their weapons, and captured Hongjuseong Fortress on March 20 that year. When the canon attacks of the Japanese intensified, however, hundreds of soldiers died, with the corpses abandoned by the banks of Hongjucheon Stream and around Namsan Mountain. 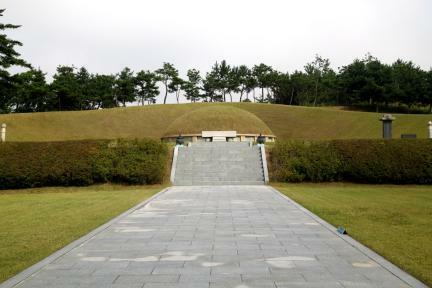 When they were identified as the remains of the soldiers who had fought the Japanese in 1949, they were moved to this tomb in Hongju. 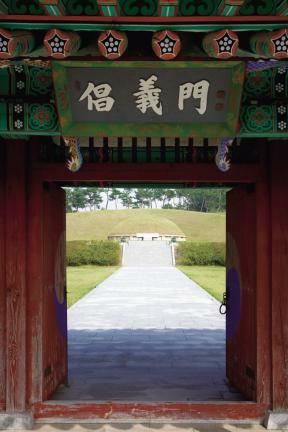 Judging from major records dealing with the Hongju righteous armies such as Hongyang ilgi (Diary of County Magistrate of Hongju), Hongyang gisa (Records of Battle of Hongjuseong Fortress), and Joseon choegeunsa (Recent History of Joseon), at least 98 and as many as several hundred soldiers died in the battle of Hongjuseong. 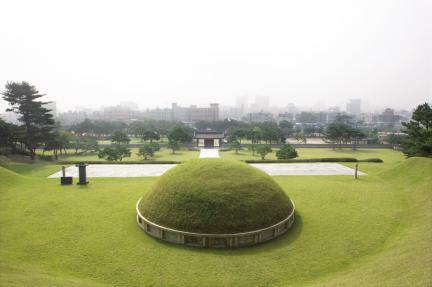 The mound of the tomb is surrounded by stones at the bottom; on the right is an epitaph composed by Jeong In-bo and executed by Sim Sang-jik. There is also a pair of stone pillars in front of the tomb, one each on the left and right. 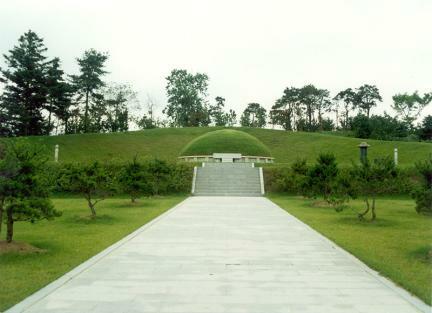 Because the nearby Changuisa Shrine honors the souls of the 900 soldiers who died fighting the Japanese, the tomb was originally called Gubaekuichong (tomb of 900 soldiers) but renamed Tomb of Patriotic Martyrs in 1992. 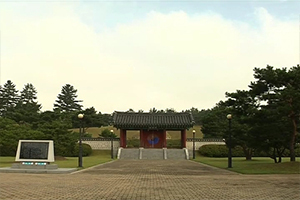 On May 30 every year, a memorial ceremony is held at the tomb, which is an important site for honoring the patriotic spirit of the soldiers who died while defending the nation.